Most bicycle racers of the Western US have participated in the Valley of the Sun Stage Race at some point in their cycling careers, whether it’s in search of upgrade points in the early season or racers from Colorado coming down to get in 3 days of sunny racing. For me, it was the second time doing the race, after coming out last year with a full Pista Palace team. The race features a flat 14 mile out and back time trial, followed by a usually brutal 94-mile road race, and ending with a flat criterium near downtown Phoenix. 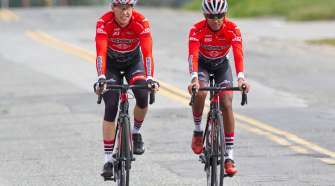 This year the Pro-1 field featured 60 riders which included full squads from my team, SPY-Swamis-SKLZ, the Garmin U23 team, Simple Green, and local teams Bicycle Haus and Landis-Trek. Also there were riders from Jamis-Colavita and Kenda/Gear-Grinder. What can you say about a time trial? You go hard and hope you don’t explode. There is more to be said about what goes on in the weeks and months leading up to the time trial than about what goes on during the time trial; time spent on the TT bike, how many miles you put in the off season, how you approach the weeks leading into the race. 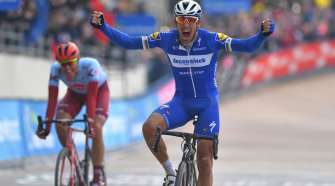 John Murphy (Kenda-Gear Grinder) showed everyone what a season of racing a Grand Tour and Paris-Roubaix does to your legs by winning the time trial by 15 seconds with a time of 28:58, the first rider to go under the 29-minute mark since Jonathon Chodroff’s inhuman effort in 2010. 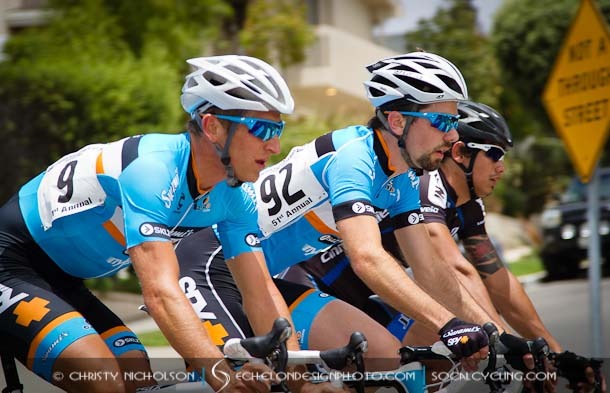 In 2nd place was 2010 NRC Champion Luis Amaran of Jamis Sutter Home. A further 30 seconds back was myself, rounding out the podium. To be able to stand on the podium with the likes of Murphy and Amaran is something to be proud of. Close behind me, in the top 5, was a Garmin U23 rider and local Powerhouse Eric Marcotte (Elbowz Racing), but I had a full team, including two other teammates in the top 10, so we would be able to put in a good fight to maintain our GC spots. The road race of Valley of the Sun is always tough. With riders looking to shake up the GC with long break-aways or time bonus seconds, With 94-miles of racing on tap in hot and windy conditions, and a climb that drags on the finish line, it takes a toll on everyone. Last year there was a big break in the road race that put 10 minutes into the field and determined the final GC. None of the top TT finishers made that break and at the end of the weekend had nothing to show in the final GC for their strong TT results. I was hoping this year would not be the same. The race started out fast and stayed too fast for the first lap for any breakaways to stick. One rider from Bike Haus was off the front by himself as we began the 2nd lap, and as we crested the climb for the 2nd time the pace picked up as riders went for the KOM and time bonuses. A small break got up the road for the KOM but were soon brought back to the field. Eric Marcotte (Elbowz) was part of the KOM break and was off the front soon again after being brought back. As we raced down the hill at full gas and approached the right turn, something bad was about to happen. Just after the right turn a car was stopped in the middle of the road. 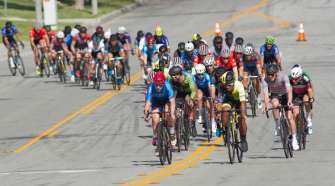 As we were single file, going full gas, the lead 20 riders all took the corner sharply enough to be able to stay to the right of the car, but as the trailing riders swung wider and were more focused on the wheel in front of them they plowed into the back of the car. I looked behind me after the car to witness a horrible scene of riders and bikes flying over the top of the car. At least 5 riders crashed directly into the car, with many more hitting the side of it or hitting other riders. I was fortunate to have made it through safely, and all of my teammates also came through without any major injuries. Unfortunately the riders who hit the car directly suffered from broken bones and some bad cuts, but, it could have been a lot worse. One of the riders who was not so lucky was GC leader John Murphy (Kenda/5-Hour Energy pb Geargrinder) who was forced to withdraw with a broken hand. As the field came around to the finish line a lap later, we were neutralized until the injured riders were safely taken off the course. Finally, we were given the green light to begin racing again, but with our race reduced by 1 lap. Eric Marcotte (Elbowz) was in a break with 3 other riders right after the neutralization and my team, along with Amaran (Jamis-Sutter) traded pulls to bring it back about a lap later. On the last lap it was still all together and everyone finally seemed content to wait until the final climb to go on the attack again. I was really tired from a lot of chasing, but was able to hang on with the lead group on the final climb and maintain my GC position, now in 2nd place after Murphy’s unlucky crash. Eric Marcotte (Elbowz) took the sprint finish, followed by Austin Carroll (Simple Green) and Chad Hartley (Kenda/5-Hour Energy pb Geargrinder). The criterium does not usually shake up the GC at Valley of the Sun, but this year was a new course that had a lot of technical turns and gusty crosswinds that would break the field apart. In the first 5 laps Eric Marcotte (Elbowz) and Luis Amaran (Jamis-Sutter) were initiating a break. Travis McCabe (Landis-Trek) was originally in the break but came back to the field, while Chad Hartley (Kenda/5-Hour Energy pb Geargrinder) was able to jump across to Marcotte and Amaran. The trio worked well together on the technical course and quickly built up a gap of 30 seconds. A lot of teams in the field missed the break and worked to bring it back but it was not enough. Halfway through the race a lot of groups were starting to get spit out the back and lapped by the leaders. In the final 15 minutes of the race a group of 4 went up the road and joined another group of riders who were lapped, and together they all worked to distance themselves from the field. Chad Hartley (Kenda/5-Hour Energy pb Geargrinder) took the win from the 3-man break, with Amaran finishing in 2nd to secure his GC win, which has eluded him for the past few years. Eric Marcotte (Elbowz) finished 3rd in the crit and gained enough time to move up into 2nd in GC. I was originally in 3rd on the GC, but after a couple protests (because of the confusion caused by chase groups working with lapped riders) the refs came out with the final GC that had a Garmin-U23 rider in 4th and myself rounding out the top 5 in 5th place. It was a really crazy weekend of racing, but it was great to get a good result this early in the season and to have the first stage race of the year in the legs. Now for 3 weeks of training and crits before the hard stage races of March arrive. by SPY-Swamis Development Elite Team.